The amplifier is finally done! It took me over a month, working a few hours on the weekends. The rebuild is dedicated to my patient and understanding wife (I wouldn't say "supportive" :-) as she wasn't trilled by my activities). I have a lot of spare parts now to address future needs - almost enough actually to rebuild a second one. The only thing left to do is to align the input networks for minimum SWR and to stretch a little bit the coils of the parasitic suppressors. It turned out that the suppressors were heating up at around 28.3 MHz which is somewhat low! By spreading the turns I'll lower the inductance in hope to raise the cut-off frequency towards the upper side of the 10 meter band. Lower power output is expected on 10m but this is normal! On 10m if the band is open you don't need a lot of power anyway - when it is closed, 50-100W more is unlikely to help a lot. I never cared for the "Heathkit Green" paint. It looks very dated to me. I went for a more sophisticated look for the front panel - I think it came out really sharp. I was going to paint the panel in light grey with black lettering (like the QRO Tech. amps - similar to the "Lab grade equipment" look) but at the end black & white looked pretty good too! The other front panel modifications are the two status LEDs and the "Stand-by/Operate" switch. The left LED is a Bi-color LED displaying the status of the switch - Green for "Stand-By" mode and Red for "Operate" mode. The right LED is a blue color one and indicates the KEY down signal - it goes "on" when the amp is keyed by the exciter (Tx). The amplifier is ready for integration in my shack. I made all of the high-power coaxial jumper cables using RG-393 MIL-spec silver/teflon cable. Diamond 2-position RF Switch will switch the output between the antenna and the dummy load. Bird 43 meter /w 1000H slug will show the amp's output power for now. Later on I am planing to replace it with a Telepost LP-100A vector watt meter. I am already using one (LP-100) to monitor the input RF power. The amplifier will run on 110V until I find time to install the 220V line - most probably in a couple of months. I have just finished reading for the third time your pages on the SB-200. All I can say is... This is the best rebuild job I've ever seen. I have a '200' sitting in the box ready to be redone and your pictures have inspired me to go for it!. I may ask for help determining the best way to update certain circuits when I get to them. Thanks for a beautiful job on rebuilding the venerable SB-200. 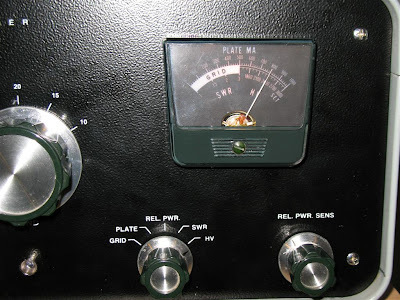 I have just read your article on how you re-build a Heathkit SB200. I have one on my bench right now and it is a totoal mess but after reading what you have done I cannot see why I cannot re-build this one. Tnx for the inspiration and I will stay in contact with you if (and I know I will) need help in the future with this project. I am a retired professional broadcast engineer and I marvel at your professional planning and performance. I have an SB-200 coming that is a complete unknown quantity. I just hope this ole brain and muscle will let me do half as well. I like your work, have 2 SB-200 and one apart to be redone, could you let me now where to purchase some of the stuff at that you used. There are 3 sources that I can think of - eBay - I've seen whole SB-200 bandswitch assemblies for sale. They sell ceramic wafers with contacts for the bandwitch - a bit steep price tho. He used to have a lot of SB-200 parts, left over from his 6m conversion business, including bandswitch parts - not sure if he still has any but give him a shout. When you say "It is shorting" make sure that the reason for the "short" is not a component connected to the switch - like a capacitor (vaiable or fixed) or a coil. Another rason for short could be a loose contact point - these are riveted to the ceramic wafer and can be fixed as well. Yet another possibility is metal contamination (something that can be cleaned). The most serious damage to the bandswitch which will almost always necessitate a replacement is damage from arcing - pitted or melted contacts. Otherwise see if you can repair it! Very nice work, Thanks for sharing your project on the web. I have an SB-200 I am rebuilding and really appreciate the references, photos & insight. 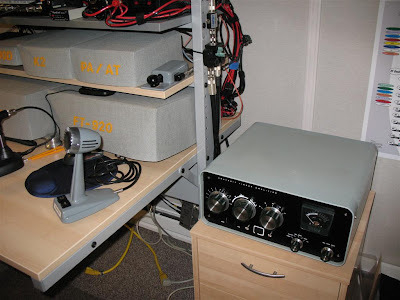 This is way amateur radio is meant to be. You can find a panel from MLT67 on Ebay. He does not have any for sale right now just SB-220 panels. He makes them in batches, so keep checking his listings. I purchase my front panel from a fellow on eBay (not sure of his handle there). At the time he was offering the classic Heathkit green version and white on black version. He was willing to even make me a custom one with different base color but the lettering had to be white (I guess it had something to do with the silk-screening). At the end I decided in favour of the black panel. I've done some research on alternative methods for creating front panel graphics, but nothing was able to beat his price/quality. geat job.. trying to figure out the wiring for the led lights. can not quite make it all out in the picture. do you have a schematic of the wiring for the led's and hook up of the meter. Here is a crude schematic of the LED wiring - hopefuly this helps! Let me know if something is unclear! that answered my question. thank you. now waiting to take my test again.. i had let my license expire and have to take again. so will have to wait on some upgrades untill i get new license. should have never let it expire. have to have it to get from harbach. right now have some of the mods installed. where did you hook on to the soft key at. on your blue light you have it connected to the soft key. just wondered where at on the soft key. have most of everything hooked up. just not sure where to hook on to the soft key for the blue light. schematic says to hook to soft key. On the LEDs schematic ( http://webpages.charter.net/kotarak/SB-200-LEDs.jpg ) where it says "to softkey module" - this is connected to the input of the softkey module - the BLUE wire (normally, directly connected to the external KEY jack). In my case, the thin coax from the switch is directly soldered to the softkey PCB's BLUE wire pad. I have added a switch (STANDBY/OPERATE) which breaks the circuit of the KEY signal when in STANDBY so the softkey module can not be activated even if the KEY jack is grounded by the PTT. When in OPERATE position, the radio's PTT signal connects the KEY line to GND (inside the radio). This GND on the KEY line activates the softkey module (amp goes to TX mode) and also provides GND for the Cathode of blue LED - the LED indicates that the amp is keyed (TX mode). Clipperton Is. DXepedition - disappointment!